of Mercedes-Benz” documents its entire product history. over 60 exciting, action-packed film clips. vault of the DaimlerChrysler archive is exclusively on this DVD. It is the birth of a global enterprise. At the start of the 20th century, two engine construction buffs, Gottfried Daimler and Carl Benz, write a new chapter in the history of the automobile. In this episode we will deal with the car models in this initial stage, the start of a brilliant development in the sign of the star. Find out what grand vehicles are behind the names: “Nürnberg“ or “Stuttgart”. 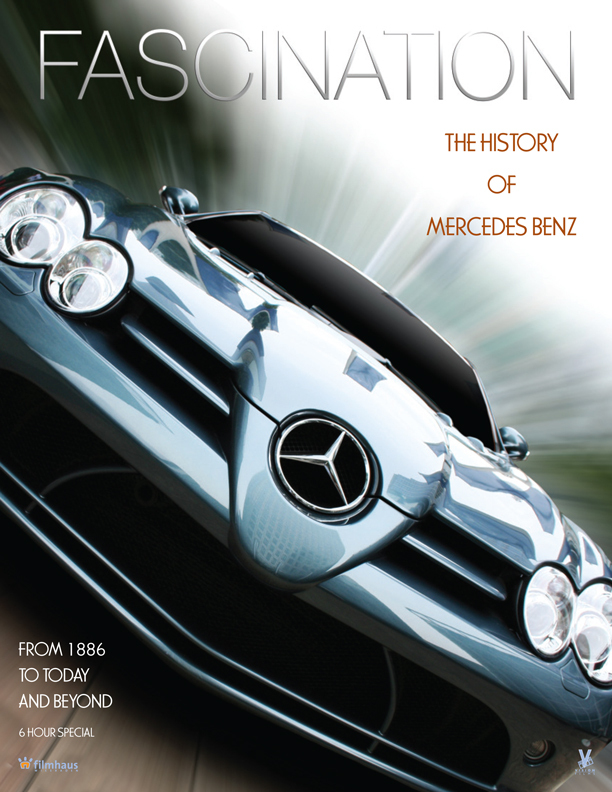 Experience how the brand Mercedes-Benz became world-famous. It is the post-war and reconstruction era in Germany. In Episode 2, the history of the brand “Mercedes-Benz“ continues to unfold. It is now the famous models “Ponton”, “Pagode” or “Pullmann” that bear the star. And the era of the famous roadsters and coupes. Automobiles master class with the 300 SEL. New engine models also bring legendary success in motor sports. The name “Silberpfeil“ was established in 1936 and to this day is the name of the Formula 1- super racing cars by Mercedes-Benz. Epiosde III and the new generation. It is the era of flower power and social revolution In the 1960s and 70s, the brand Mercedes-Benz evolves into a leading automobile manufacturer and expands its product range, inter alia also the legendary “Strich 8”. A miracle with regard to economy and durability that is soon at home all over the world. The S-class becomes the name of an independent model series. Even today, the most successful vehicles of the Mercedes-Benz brand are behind the model series 107-123. A new era starts for the Mercedes-Benz brand in the 1980s. It is the era of new models: Mercedes- Benz starts an aggressive product campaign. In Episode IV we will deal with the new A-class and the C-class, from the Compact-Class to the new sport coupes. Today, many of the vehicles already belong to the youngtimers. And they are loved and cared for. And the stakes are good for Mercedes-Benz lovers. Because Mercedes keeps necessary spare parts on stock for all vehicles which have come off the assembly line since the start of mass production. It is thus one of the few enterprises that makes such enormous efforts to preserve automobile history. The aggressive product campaign at Mercedes-Benz continues in Episode 5, namely with the models of the Eclass, CLK-coupes, CLK-convertible and of the M-class. The customers’ demands have changed. The hallmark of this era are the many technical developments. Comfortable driving, optimum safety, mobile entertainment-the foundation for all these were laid here. Mercedes-Benz holds many patents that are standard today such as the airbag or safety systems. Find out more about the start of the “New Era”“. 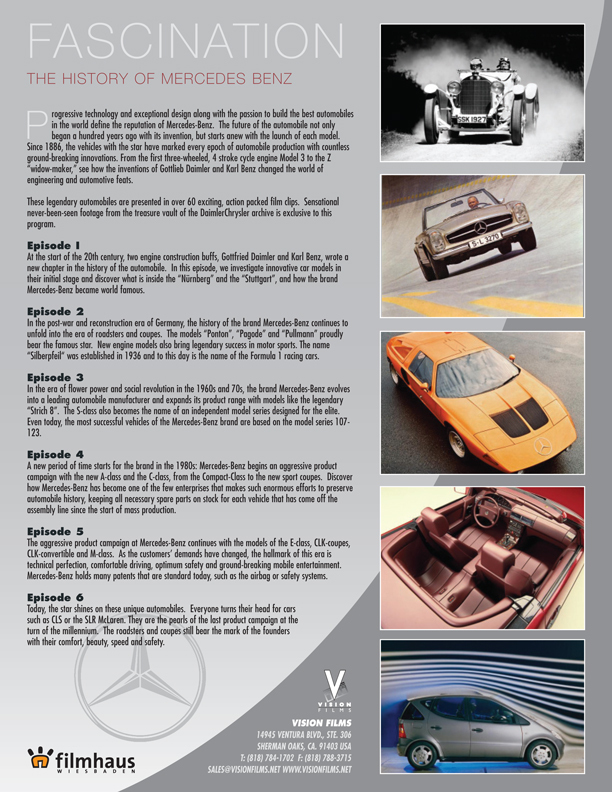 Episode VI marks the zenith of the most recent history of Mercedes-Benz. Everyone simply turns their head for cars such as CLS or the SLR McLaren. They are the pearls of the last product campaign at the turn of the millenium. SL and SLK are the pets of the high society worldwide. The roadsters and coupes still bear the mark of the founders and their desire for comfort, beauty, speed and safety. They made it. Today, the star shines on to stand for unique masterpiece automobiles.